This past week we had a #innochat tweet session(www.innochat.com) around Jeffrey Phillip’s book “Relentless Innovation”( http://amzn.to/xXoHof ). The chat was framed around a set of questions here (http://bit.ly/Awvh5E ) but basically the premise of Jeffrey’s thinking was “can it be possible to shift from business as usual (BAU) to innovation business as usual”? He suggests that one of the most significant challenges for innovation is the fact that many firms have spent years, if not decades, creating business models and operating processes that are exceptionally efficient and effective but neglect the essential part that innovation plays. Equally the middle manager is so focused on the delivery of short term results through effective organization and pursuing efficiencies they have little ‘slack’ within the system to learn and build innovation into it. I would possibly argue the very people that we are expecting to manage the ‘dynamics’ within organizations, the Middle Managers, are seeking the very opposite- doing everything possible to keep it as stable and consistent as it can be. So how can this change? Change is the word. If you accept the premise of BAU and Middle Managers holding back innovation, then we need to contemplate change, a more radical agenda of change. Jeffrey in his book goes some of the way in offering up different solutions to this but I think we should think deeper and harder, around a fully fledged innovation change management programme. Let me offer some thoughts. How can we move the needle and tilt it more towards innovation? I can think of five immediate ones to contribute to this debate that would significantly advance the change called for in Jeffrey’s book. Recognizing the middle manager holds the organization together, they are the glue that connects the organization with the leadership and enable the ‘forces’ to flow. Lets turn their existing core competencies on their head. The mix of primary, critical and core capabilities that are the measuring point for the MM’s new core competency set. Primary becomes the base not the pinnacle . What they do in efficiency and effectiveness remains as their primary capability- you don’t alter this, it is too engrained. This can only change over time and through their inner awareness and recognition that innovation needs to be embedded, alongside the existing ‘fixation’ on efficiency and effectiveness. Don’t try to radically change, make progressive step changes. Efficiency and effectiveness clearly remains the inventory repertoire of solid capabilities so as you set about to build a new platform, based on innovation, it layers and interlocks. You target selected critical capabilities to learn and explore. You provide the MM a clarity of the new and emerging critical capabilities they need to build up. These are the capabilities that will provide the greatest impact for competitive advantage, not internal but external in all its orientation. Systems thinking. The idea is to introduce a distinct innovation system thinking approach as a conceptual framework that allows people to study innovation as bounded objects that make up the innovation ecosystem, that needs to be in place within their organization. Overtime it will help measure the performance of the organization as a whole, and of its various components, and the organization rewards on the ‘whole’ not on selected parts. This shifts the ground for middle managers to manage within. Personal mastery. The commitment by an individual to the process of learning is known as personal mastery. This is their part of the core capabilities they need to be seen as making a direct contributino to the competitive advantage the organization believes is its set of goals. The workforce can learn these more quickly once identified, and apply them, so it is therefore important to develop a culture where personal mastery is practiced in daily life, based on clear capabilities needed to be practised. Shared vision. The development of a shared vision on the place that innovation occupies. It becomes important in motivating the staff to learn, to relate too, to create those essential common identities of the value of innovation’s contribution and their distinct contributing part in this. This sharing and identity gives real focus and energy for learning. Team learning. The accumulation of individual learning constitutes the last aspect, into team learning. The value of the middle manager in bringing people and their contributions together is vital, this is done in efficient and effective ways but also in increasing experimentation to understand and find the ones that often just seem to work . This needs structuring for encouraging boundary crossing and openness for both shared meaning, and shared understanding. 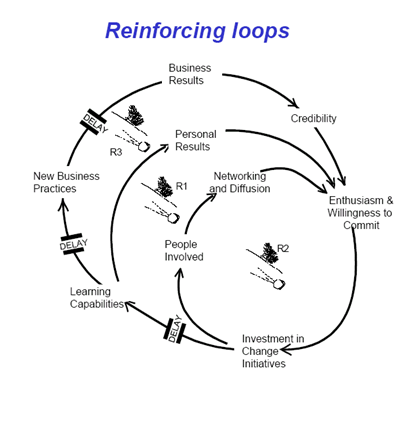 So in our new learning we recognize the value of the three learning loops- the first loop, the single one is reinforcing what we do, whereas the second loop or double loop is learning through increased insights what we can do, what is possible, what and who can contribute to ‘our’ advancement of innovation in establishing competitive advantage in these two way, increasingly open exchanges. The third loop is the real learning loop- the one where innovation takes hold, where the establishing principles, capabilities and competencies goes beyond insight and discovery- the beliefs in what we should be- our triple learning set of loops. Moving from a certain static, predictable level to a more dynamic one where innovation thrives. This is the multiple conversation loop, built on enquiry, one feeding off another, a more open (innovation) approach and allowing these to evolve, often in seemingly unstructured ways. So the middle manager has to think through a new agenda for innovation change and the organization has to ‘fully’ provide the necessary support and structure for them to move towards this (radical) change in their managing within the middle. I wrote about this in a recent blog (http://bit.ly/zrzJc1 ) on “the value of having an innovation coach”. In this I offered the four stages we all go through in changing behaviours that I really believe can be applied here specifically. Unconscious Incompetence– this is often a self reflection stage where the person, in our case the middle manager, reflects and draw out areas of incomplete knowledge on innovation. These become the agenda to learn about and need organization support. Conscious Incompetence– From these reflections you gain insights, you begin to explore tested tools and techniques, you begin to frame new references that are relevant, you begin to explore and experiment, the middle manager encourages others within the organization to do the same. They look consciously for growing confirmation that it has real value in contributing to advancing innovation towards competitive advantage. Conscious Competence– As you begin to ‘grasp’ differences this enables experiences to build up so a middle manager can do what he is good at, look at the alternatives with a growing confidence and some ‘matching’ begins to occur and you see an emerging path for innovation action beginning to emerge from this. Unconscious competence– the final part where the impact of what has been learnt, understood, investigated and explored has a real personal impact. It seeps into the make-up of the person and changes there ‘going forward’ behaviour. These comprehend the value of innovation meaning differently than their original perspective and build their personal core competency levels. These become their clustering points of contribution and expertise as the way they will manage innovation going forward as the increasing value ‘gels’ for them and it integrates more and more into the existing efficiency and effectiveness mind set to move BAU into Innovation BAU . In any change we pass through different aspects, the building blocks for successfully navigating any change. For instilling innovation as part and parcel of the day-to-day, working within an organization and ‘radiating’ from the middle manager this is achieved, but only over time and in clear steps. The ADKAR methodology was created by Prosci Research back in the nineties. Effective management of the people dimension of change requires managing five key goals that form the basis of the ADKAR model . ADKAR is simply the acronym for Awareness, Desire, Knowledge, Ability, and Reinforcement. These are the elements of the the most fundamental requirements for anyone to succeed and maintain change. Once you identify the first weak element, you have identified the resistance to change. Therefore, these elements cannot be reordered or skipped. You need to move from one to the next once understanding has been fully established along the ADKAR escalating model . This model tries to attack the root of the resistance, in this case establishing innovation within the day-to-day working model of the organization. What really gives this model the edge is its emphasis on individual change and each middle manager has different needs, innovation competencies and understanding to learn to embed in them, the change needed. Change is often seen very differently, person to person. So these are my 5 thoughts to contribute to embedding innovation into business as usual. Until we approach innovation in a clear, methodical learning way, it will never fully ‘take hold’. Building innovation capabilities and competencies is where I hang my advisory hat- no shame in that- and we need to recognize the value of having a more structured approach to tackling this. Otherwise we all remain frozen in perspectives (personal), in implementing ‘parcels’ of innovation skills that is not ensuring innovation has a holistic approach from vision, through mission into its delivery. We suffer far too many ‘frozen innovation moments’ . This entry was posted in Molecules and tagged changing business as usual with innovation, embedding innovation, Innovation and change, innovation and learning, learning loops for innovation, managing innovation through change, relentless innovation and change needed, structing innovation organizations. Bookmark the permalink. ← Your dominating innovation design is? The challenge of getting past the idea creation phase of innovation is often a difficult one, particularly for large, established organizations. I highly recommend people read the book The Other Side of Innovation by Govindarajan and Trimble. They are locked into many of the issues raised by Phillips, and have a well thought out approach to considering the implementation side of innovation. At the heart of their thinking is the need to recognize the performance engine of a business is the wrong mechanism through which to drive change. As you note above Paul, the MMs have the mental models and learned behaviours and measures for driving effectiveness and efficiency. Innovation requires different organization, accountability and metrics, that are often not compatible with the MMs capabilities. Effective innovation needs independent leadership, integration with the performance engine and recognition from the senior management that different metrics and a process of learning have to be attached to innovation. This is a hugely simplified version of G&T’s view of implementing innovation. Hi Michael, I expected so much more from the book the Other Side of Innovation by VG & T. I tend to fall into the other camp of not cutting out innovation from mainstream as they seem to recomment in what he authors call this the Dedicated Team, and they note that many of the things the Dedicated Team does is in direct conflict with the Performance Engine- don-t disagree with this. My point is we have to work through this conflict and not hive it off. As I said earlier, this book was a real struggle for me. It really did not go into the expected detail I was hoping for as execution is an extremely tough part to deliver especially when your management is in conflict and mixed emotion on managing innovation well. I think we cannot break this out as seperate, we need to develop methods and approaches where each is embraced and worked upon.